Sisters Maria and Tess Cuevas have been making music together since they were big enough to hold instruments. Call it a family tradition: For a decade, Maria and Tess toured with their grandmother’s Mexican folk band, Mariachi Estrella. When Mariachi Estrella came to an end, the Cuevas sisters took the opportunity to begin a new project. In 2011, they found blues guitarist Garrett Nordstrom to play for them, and the newly formed Maria the Mexican began discussing content for a debut record. Moon Colored Jade was released earlier this month, and the sisters have a slew of release shows scheduled. 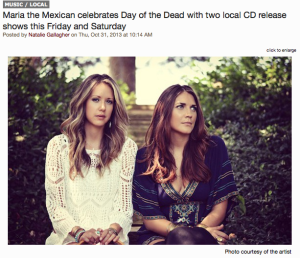 We caught up with Tess Cuevas ahead of Maria the Mexican’s local shows this weekend at Knuckleheads Friday, November 1, and at RecordBar Saturday, November 2.